Culture, cuisine and holiday destinations aplenty. What to do there? Negeri Sembilan is known for its natural wonders and you can experience it yourself at the Tanjung Tuan Reserve Forest. Also known as Cape Rachado, it’s an easy walk up a tarred road to the peak where you can also find the Cape Rachado lighthouse which is still in use since the 16th century! From the peak, you can also take a staircase trail that brings you own to a few hidden beaches fit for picnics and relaxation. For the historically-inclined, a trip to the Lukut Fort and Museum is in order. Located on Bukit Gajah Mati (Dead Elephant Hill), the fort was built in 1847 by a Bugis warrior named Raja Jumaat to exercise his power and monopoly over his tin trading empire. Amidst the ruins, mud walls and moats stand along with a recreation park. 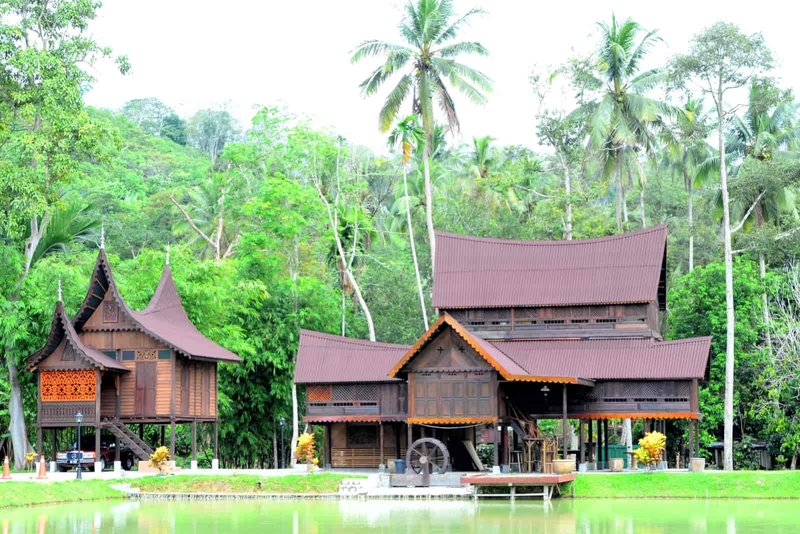 The Lukut Museum also provides historical and cultural information about Lukut as well as the customs and traditions of Adat Perpatih. Hot springs are also a natural feature unique to the state of Negeri Sembilan. Since they were discovered by the many centuries ago, it was believed the water in the hot springs had healing and therapeutic properties. Now, there are water theme parks such as Pedas Hot Spring Water Park that incorporate the hot springs in a way that is safe for families and children to enjoy. Negeri Sembilan is also home some of West Malaysia’s most beautiful stunning retreats, perfect for a staycation over the weekend with your loved ones or friends. You can even arrange a BBQ session or celebration for any occasion too. There are romantic high end resorts by the beach such as such Lexis Hibiscus Port Dickson, and even nature resorts in the jungle such as The Dusun and The Shorea. What to see there? Then Tze Khoon, otherwise famously known as the Centipede Temple, is a 140 year old Buddhist/Taoist temple located on the top of Bukit Jung. There’s a huge stone centipede statue based on an old legend. There are also plenty of statues and figures here and the top of the hill provides a great chance to get some good photos. Despite being a small town, Pengkalan Kempas located nearby the border with Melaka has an interesting area called the Kempas Historical Complex. It contains various ancient stones that are said to date back to 2 or 3 AD. This also includes a ‘lie detector’ stone that will trap your hand if you don’t tell the truth! Nilai is also a town to visit if you’re keen on doing some shopping. The town is known for its textile shopping centres but you can also find goods such as furniture, gadgets, lighting, and household items at great variety and affordable prices. Shopping here can take up a full day and it is best to set up an itinerary to visit all the complexes. Alas, a trip to Negeri Sembilan is not complete till you’ve visited the beaches at Port Dickson. With long stretches of white sand and blue waters perfect for both swimming and watersports activities, you’re spoilt for choice as there a few beaches to choose from. The best include Pantai Cahaya Negeri and Pantai Teluk Kemang. Useful local terms Besides the standard Malay language spoken throughout Malaysia, Negeri Sembilan has its own version called Negeri Sembilan Malay or ‘Baso Nogoghi’. It takes after the Minangkabau language used by Minang immigrants from Sumatra who settled in Negeri Sembilan a while back. Dress modestly when visiting religious institutions such as a mosque or temple and mind your behavior. Strike up a conversation with a local to find out the best spots to eat or visit, they’ll help you out better than any travel guide. Traditional food in Negeri Sembilan food can be very spicy due to the heavy use of chili’s and spices. Be sure to sample a little bit before taking a big bite. In the smaller towns, it might be harder to get around without a car. When dealing with taxis, be sure to negotiate your price with the taxi driver before getting into the vehicle. Don’t fall for tour operators and expensive packages. Aside from extreme activities, some proper planning and time spent on an itinerary can let you travel just as easily without a tour guide. If you are spending a few nights in Negeri Sembilan, you can also arrange a day trip to nearby state of Malacca to explore other cultural and food attractions. It’s only an hour drive away from the town of Seremban. A state which carries on its legacy of rich traditions to this very day, and home to some of the country’s notable holiday spots and attractions.